Keyword research is the cornerstone of your business. Choosing what keywords to rank can make or break your business. Knowing if there’s a demand for a particular keyword and using specific terms and phrases to target your specific audience all influence your success. Understanding your customers as a whole and using the right keywords for your content strategy for your assisted living business is crucial. The first step in any aspect of SEO is always defining your goals. The same goes for keyword research. If, for instance, you only run one facility in a single location, your goals will be different from those of running facilities in multiple locations. This means that your strategies will also be slightly different. In the senior living category, SEO may not look like it fits the bill, as the older generation may not seem to use the internet frequently. The truth is that more seniors are using internet than ever before. A Gallup poll of 1,509 U.S. adults found that 52% of people ages 50 to 64 have Facebook pages, an 18 percentage point increase from 2011. Similarly, Facebook use among people 65 and older has risen from 18% to 32%, a 14 percentage point jump. You might not gain enough traffic with your content marketing effort or possibly have given up on SEO, but think about how viewers might use different keywords when searching for a product. And who are they? This brings us to the next point: your audience. Your audience is your target market. It could be the prospective resident or their loved ones. In some cases, the people you communicate with may not be the same people who take advantage of your services. You may target adults in their mid–40s who are actively earning incomes and need to take care of their aging parents, who are becoming weaker and can no longer actively earn incomes. Or perhaps younger adults or maybe write evergreen content for broader goals. In my previous article, we discussed who your target audience is and why you should target them specifically. After you have defined your goals, you need to define your target audience. The best way to do this is to create customer personas to help you target your content and identify which keywords work best for each persona. By now you are ready to start thinking about the keywords that should be incorporated into your content. This will be the primary focus of this article. You can collect valuable insights by reviewing Google Search Console. Data from any AdWords campaign will also provide insights into the search terms that users key in, in order to access your site. The copy on your website will also give you ideas since you likely use certain keywords more often, just like your prospects would. Look out for more specific keywords from your internal pages (e.g., careers, senior care jobs, services, etc.). You can use a keyword density checker tool by GeoRanker to determine how often your pages utilize a particular keyword. Make sure to avoid overuse of a keyword since Google views this as manipulation and refers to the practice as “keyword stuffing”. You should also think about the keywords that would be relevant to your particular facility. You may want to consider geographical terms, keeping in mind the fact that Google’s emphasis is on localized results. You’ll need to narrow down the options to more specific terms. For example, “coastal assisted living”, “assisted living near me”, or “assisted living with physical therapy for heart attack patient”. This is because they probably have certain preferences. Many potential customers will likely prefer a facility that is near their home or where the children live or work. Others may be looking for affordable facilities, or those where pets are allowed (making amenities vital), nearby hospitals, patient-to-staff ratios, and online reviews. Tools like the Google Ads Keyword Planner help you come up with keyword ideas and their search volumes. You will also want to collect a handful of your competitor’s URLs to identify more keyword ideas. To find keyword ideas on Google Ads, click “Go To” and type “Keyword Planner” in the search bar. You’ll want to click on “Download keyword ideas” in order to add all keywords to an Excel spreadsheet or .csv file. Another tool that you can use is the SEO Book Keyword Suggestion. When it comes to choosing search terms, go for keywords with high volumes but low to medium competition. Once you have accessed the Google Trends platform, choose the geographical area on the top right. Let’s use “The United States” or local neighborhoods. You also need to choose a period range. Let’s work with 12 months. Our search terms are “nursing homes” and “assisted living”. Key in the first search term, then press enter. Click on the plus (+) sign on the right and enter the second search term. As you can see, “assisted living” is a more popular search term than “nursing home”. Consequently, you will put more energy into ranking for “assisted living” over “nursing home”. Tools that give you search volume data will work even better when combined with a tool like Google Trends. Comparing top keywords while looking at trend data will help you make an informed selection. Google Autocomplete is probably the easiest tool to use for your keyword research. It is also appropriate for long-tail keyword research. The tool works via the concept of search predictions, or possible search terms that are related to a keyword that you are typing, and what people are searching for. For the best results, use Google Chrome. and change your search settings to “never show instant results.” This will help you get at least 10 autocomplete suggestions. Use underscores and Google is smart enough to fill the blank for you. You can also try different word orders and grammatical alterations like plural or singular versions of the same word. Other tools you can use include Moz Keyword Planner (which allows you to group keywords), HubShout WebGrader, and the MozBar Chrome Extension (which highlights keyword competition). Google’s algorithms prioritize local search results. It’s crucial that you target localized keywords that use specific names of your physical location or words like “near me” and “assisted living facilities near me”. Other factors that you could consider include the device used to access the internet. Do you remember the report by Google and Ipsos we mentioned earlier? It’s results showed that senior citizens use the internet on their desktop, although the use of mobile is increasingly growing. This will come in handy if you run ads and need to target by device. LSI (Latent Semantic Indexing) can be defined as a method used to determine the relationships between terms and concepts in content. LSI keywords can be defined as words and phrases semantically related to each other. A good tool to search for great LSI keywords is LSIGraph. It is important to use only keywords that users will actually use when searching for an assisted living facility. If no one actually uses the keywords, then they are pointless to target. This is where search volume comes in. Discussion forums will also give you excellent ideas. You can search for your main keyword in a discussion forum and see what questions people ask about your services. Other places to find keyword ideas and niche topics include Wikipedia’s table of contents. 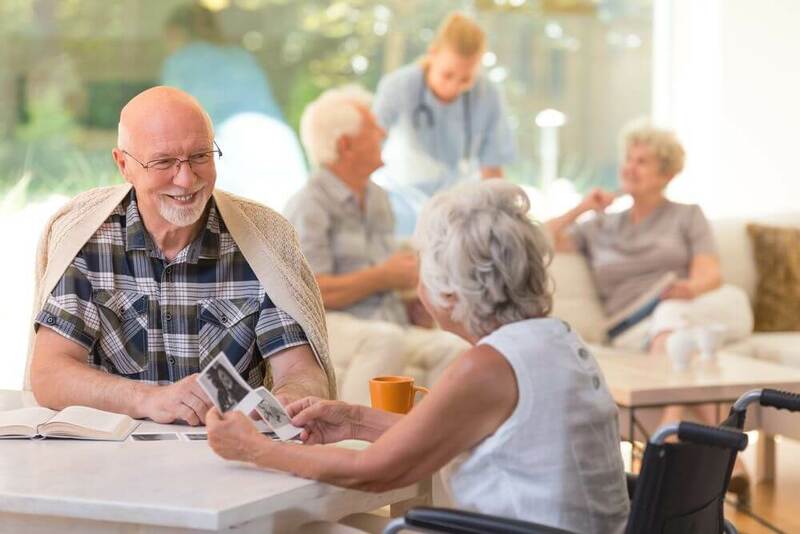 Senior living can be a highly sensitive topic for both the senior citizen and the adult children who want the best for their parents. The parents may also feel that the children are neglecting them by leaving them to be cared for by strangers. Understanding your audience and their motivations should be a key factor in your keyword research and content creation. You should generate keywords and content ideas from real-life experiences. Going through Quora, Reddit, Twitter and Facebook groups can help you find related keywords and ideas on what you can do to help your potential customers. The advantage of having a tool like this is the ability to stay on top of relevant content that you later incorporate into your content strategy. Your customers might want to discuss or learn more on relevant news articles related to the industry. Why not be the first to come out with a comprehensive article to showcase your thought leadership in the industry? The bottom line is that your keyword research should ultimately result in content that provides value to your readers and helps answer their core questions. Keywords have been at the core of SEO and ranking for a long time. However, as Google becomes smarter and now has more sophisticated algorithms, the importance of keywords has become less magnified. You now need to do more than ensure that a keyword like “5 stars assisted living” simply appears on your site; today, search engines are able to identify context and better align search queries with the user’s intent. This is because search engines are now beginning to incorporate the semantic web concept. The semantic web or web 3.0 focuses on the meaning of words and even their relationship with people’s online behavior. What this means is that just having keywords on your web pages doesn’t cut it anymore. You still need target keywords in your title tag, H1 Tag, early on in your content, ALT Tag and Meta Description, but it is no longer about the frequency of use of keywords in a piece of content. As you can see, these are all broad topics that could further be explored and broken down. It means that keyword research has become a source of content ideas since high-value content is at the core of the semantic web. It is more about how the user interacts with your content rather than whether the content uses high ranking keywords. Recall our discussion on creating topics that you can use to create content. This will come in handy in the era of the semantic web. Over and beyond, you need to ensure that you provide your users with free, valuable digital assets. In the assisted living space, it may be as simple as a downloadable PDF with content about “how to deal with a potential resident” (targeted at the adult children). You may also be a bit sophisticated and provide a tool which would help the residents find the nearest specialists or recommendations of hospitals should they need help with medical care. Take the time to educate yourself on this new concept and find ways to creatively incorporate it into your assisted living digital strategy for better results. Keyword research in the assisted living realm factors in several elements, from the more technical bit of using tools for keyword generation to the more human, social or offline side, where you actually interact with your audience in person to ensure you understand their intent and concerns so that they are adequately addressed in your content. Finally, the semantic web concept cannot be ignored if you are to see any success in SEO for assisted living facilities. The best thing to do is be in the know and learn from those already using it in other niches or industries and incorporating it into your own strategies. Please leave your comments below. We’d love to know what keyword research strategies your team is currently utilizing. Of course, if you would like professional consulting, do not hesitate to contact me directly for a complimentary consultation. I hope to hear from you soon!